UP is setting the tone for 2019 with a formidable alliance between its two biggest regional parties despite a long history of rivalry. Any new political formation at the Centre hinges on what UP, the most populous state, chooses. 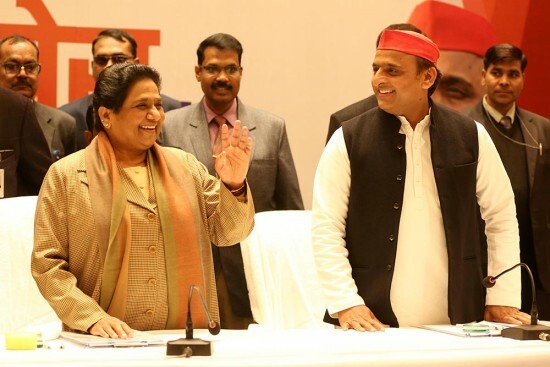 The Mayawati-led BSP and Akhilesh Yadav’s SP have chalked out a seat-sharing arrangement of 38 each for the 80 Lok Sabha seats, leaving Amethi and Rae Ba­reli, represented by Congress president Rahul Gandhi and his mother Sonia, respectively. The ­alliance is historic, say observers, ­signaling a coming together of Dalit- and OBC-led political forces and the consolidation of regional parties as a bloc outside the Congress and the BJP. The SP-BSP’s combined UP voteshare of 42.12 per cent in the 2014 general elections, when the BJP had bagged 73 seats with its allies, suggests danger for the saffron party’s prospects this year. “The alliance will work on the ground and we believe people will vote for it,” says SP spokesperson Ghanshyam Tiwari. The exclusion of the Congress has fuelled speculation over the fate of the grand alliance at the national level helmed by the grand old party. The Congress will go solo in all 80 seats and its leaders say its doors are open for a post-poll alliance with secular parties. According to a senior Cong­ress leader, the party will strive to ­bolster the winning chances of the SP-BSP alliance rather than squander its prospects. Analy­sts say the Congress would put up Brahmin candidates where the SP and the BSP are on a weak footing, thus denting the BJP’s prospects. Though the alliance could have added to its tally by bringing in the Cong­ress, political analyst Neerja Cho­wdhury says it’s a sign that regional parties want to curtail its revival at their expense. “May­aw­ati fears a resurgent Congress would be a threat to her support base,” says Chowdhury. The turn of events could open up possibilities of political realignments. While it would be a direct fight between the BJP and the Congress in Gujarat, Madhya Pra­desh, Rajasthan, Chhattisgarh and Hary­ana, the grand old party has entered into strategic all­iances with regional parties in other states. “We are looking at state-specific ties, like we did in 2004, 2009 and 2014,” says senior Congress leader Manish Tewari. State-wise alliances have been stitched in Karnataka, Maharashtra, Tamil Nadu and Bihar, though seat-sharing is yet to be finalised. In Karnataka, where its coalition government with the Janata Dal (Secular) is ­facing a crisis after two independent MLAs withdrew support, both parties say their ­alliance is firm. Accusing the BJP of trying to poach MLAs and topple the government, state Congress chief Dinesh Gundu Rao says, “If we work together and campaign sincerely, we will get 20-21 seats.” Ruling out wrangles over seat-sharing for the state’s 28 Lok Sabha constituencies, JD(S) leader P.G.R. Sindhia vouches for his party’s commitment to the coalition. The alliance in Tamil Nadu seems to be on a strong pitch with the DMK, the Congress and the Indian Union Muslim League (IUML) alr­eady on board, while seat-sharing talks are under way with others. Emphasising that the grand alliance is a reality, DMK leader Kani­mozhi says efforts are on to bring all opposition parties into the fold. “Our party sticks to the idea of Rahul Gandhi as PM. I don’t think it created any rift in the alliance,” she says. In Maharashtra, which sends 48 MPs to the Lok Sabha, the Congress has forged an alliance with the NCP. With a clutch of small parties in the coalition, NCP leader Nawab Malik ruled out any alliance with the Shiv Sena or the Maharashtra Navnirman Sena. In Bihar, the mahagathbandhan in running on full steam, with the RJD allying with the Congress, the Hindustani Awam Morcha, the RLSP, Vikassheel Insaan Party and the Loktantrik Janata Dal. While all eyes are on which side Trina­mool Congress leader Mamata Banerjee would tilt, analysts say she is likely to contest alone. With the state acc­o­unting for 42 seats, the TMC look invincible, says political analyst Rajat Roy. On the question on the PM candidate, leaders say the final numbers would decide it. “Our primary objective is to defeat the BJP and leadership questions will be addressed post elections,” says CPI leader D. Raja. As talk of a non-BJP, non-Congress federal front also on the horizon with leaders like Mamata, BJD leader Naveen Patnaik and TRS leader K. Chandra­shekar Rao taking the lead, the post-election scenario is likely to be interesting.